In order to achieve success, it is important that our students, faculty and staff have the resources - financial and academic - available to them. We achieve this success through your giving. Poet and writer Maya Angelou summed it up best when she said, "I have found that among its other benefits, giving liberates the soul of the giver." Ms. Angelou was correct. 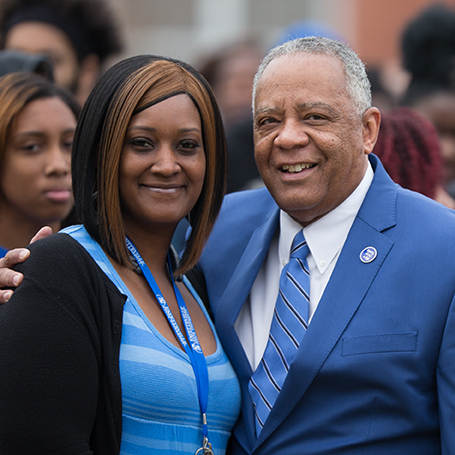 I, like many other college students, have had the opportunity to witness the euphoria donors receive when they see and hear first-hand that their resources are being used to provide the education to a deserving student. I often stand before them and share my story of an inner-city youth from Washington, D.C., who succumbed to many societal ills, was often homeless and without parents, sought solace and shelter from Catholic nuns, and often went hungry. Yet, they were determined that I would survive and not become a forlorn statistic. I could see in their eyes that they knew their investment in me was indeed a wise one that would eventually pay off. While my story is extreme many deserving young people lack the resources to pursue their dreams of college. As Ms. Angelou stated, give and "liberate your soul." Every year a number of students who have gone on to careers would come back and have a panel discussion and give students their perspectives on life, career fields and the path to success. I would come back annually for that to try to keep students encouraged and motivated. I came back to campus as a keynote speaker for the STEM symposium in 2018. Students and scholar athletes in need of financial help. Scholarship dollars will help ease the financial burden that so many families are facing. FSU to be competitive. Because everyone across the country is looking for the best and brightest, FSU needs to be able to provide appropriate compensation for salaries and professional development. FSU to be military friendly. We have received the nationwide recognition for being military friendly. We feel proud to provide military families the resources and services they need and have earned. By addressing the financial needs in all of these areas, FSU is poised to be ready to take its place among institutions that are preparing its students to be 21st century global leaders.